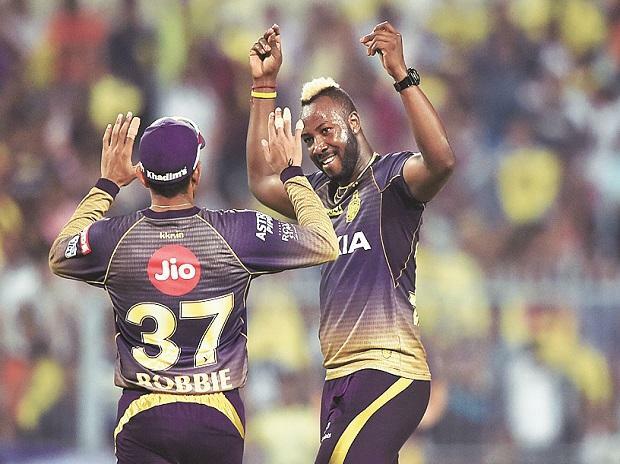 Kings XI Punjab coach Mike Hesson said "game-changer" Andre Russell completely snatched the match away from his team in the IPL clash against Kolkata Knight Riders and rued the no ball that let off the swashbuckler before he went on a rampage. Russell was on three off five balls when he was bowled by Mohammed Shami with an inch-perfect yorker on off-stump but it was declared a no ball because the side had three fielders, instead of the mandatory four, inside the circle in the 17th over. Russell then smashed eight boundaries in a row to add 44 runs in the next 12 balls to push KKR to a record 218/4 at the Eden Gardens. "It's a fine line when you're bowling to Andre Russell. He's a gamechanger," Hesson said as Russell returned with a second man-of-the-match award in KKR's 28-run win. Russell was the star with a 19-ball unbeaten 49 in KKR's six-wicket win over Sunrisers Hyderabad in their opening match here on March 24. "The game changed in the 17th over. Obviously we had a plan for Russell that we executed well, but we weren't quite alert enough in the field, and that's where the game changed." "We had that little bit of jubilation and then things turned pretty quickly (with the no ball) and we weren't quite able to turn the last few overs for 12 or 14 runs. Instead we ended up giving giving away 22 or 24 runs, and it probably changed the game." Their 14-run win over Rajasthan Royals was overshadowed by R Ashwin's controversial 'Mankading' of Jos Buttler but Hesson said the incident did not affect the skipper. "We were very focused in terms of preparing for KKR. So that's very much been our focus." Skipper Ashwin's decision to bring on their Rs 8.4 crore buy Varun Chakravarthy to bowl the second over backfired spectacularly. Sunil Narine hammered the uncapped mystery spinner for three sixes and a four in a 25-run over. Defending the ploy, Hesson said: "It wasn't so much Narine. Lynn was on strike at the start of that second over. That was the match-up we were looking for. And then Narine came on strike and you know he was able to take a toll." Hesson also backed Chakravarthy and said he was nervous like anyone else playing their first game. "The way he came back in the second and third over was excellent. And it will give him and us a lot of confidence. You know, playing your first game in front of a crowd like this is difficult. "Narine's obviously going to hit you from ball one. I think he will learn to settle down a bit quicker. But I'm still very pleased the way how he came back." Chasing 219 in an away game was always difficult as they banked heavily on their opening combination of KL Rahul and Chris Gayle. But the duo failed, both departing for 37 inside five overs as Kings XI Punjab were restricted to 190/4 in the designated 20 overs. "The first two games, we haven't got a huge amount of runs from the top, but we've got runs from the top six. Mayank Agarwal, Sarfaraz (Khan) got runs in the last game. Gayle, Mandeep has played a couple of cameos and obviously, David Miller's come in and played a role. Asked if they were top heavy in batting, he said: "I think that statement could be true for Kings XI teams of the past, I don't think it's true now. I think we've got power and ability right through the top six and even deeper." They also made four changes to the lineup that had beaten Rajasthan Royals, bringing in Miller, Hardus Viljoen, Andrew Tye and Chakravarthy. "Nicholas Pooran was injured so that's a straight swap, since David Miller's a big player for us," Hesson said. "And then on that surface, we felt that someone who can bowl back-of-a-length like Hardus Viljoen instead of Sam Curran was the way to go. And Hardus bowled really nicely, so those were two big changes.